This website has been authored by Mr Godfrey Charnley, Consultant Orthopaedic and Trauma Surgeon, specialising in hip and knee replacement surgery and intended as a source of information for patients and other health care professionals. Godfrey Charnley has over 24 years of Consultant experience in major joint replacement surgery of the hip and knee, especially revision hip surgery. He treats both young and old patients with a variety of technologies in this area of orthopaedic surgery. Godfrey qualified in 1983 from St Thomas' Hospital in London and received training as a Registrar in London and as a Senior Registrar in Bristol. His qualifications include MBBS, FRCS, FRCS Ed and FRCS Orth. In addition to his UK training, he has had Advanced Fellowship training in knee surgery in Basel, Switzerland in 1992 and Trauma and Revision Joint Replacement Surgery in Paris, France and in Pelvic Fracture Surgery in Seattle, USA in 1995. Before moving to Chelmsford, Mr Charnley was both a Consultant Orthopaedic Surgeon and Honorary Senior Lecturer in Derriford Hospital in Plymouth and at the Plymouth Post Graduate Medical School between 1995 and 2002. At the hospital, he was the Lead Surgeon in Trauma and was Surgical Tutor for the Royal College of Surgeons of England. On the basis of his educational status there and subsequently in Chelmsford, in 2007, Mr Charnley achieved the status of the Fellow of the Higher Education Academy. Throughout his career, Mr Charnley, as well has having a busy clinical practice, has been involved in under graduate and post graduate education, being a frequent lecturer or faculty member at Trauma and Joint Replacement Meetings. He has published 4 book chapters and authored or co-authored 60 publications and presentation. Many of these are on various aspects of joint replacement surgery. (Please refer to research and publications pages). For 10 years, Mr Charnley was an Examiner for the FRCS Orth Diploma and he has previously been a Regional Clinical Co-ordinator for The National Joint Registry. He regularly reviews papers for the European Hip Society's journal, 'Hip International'. Mr Charnley has been made a member of the French Orthopaedic Association and is also a member of the European Hip Society. He has given instructional lectures in complex joint reconstruction to the South African Orthopaedic Association and gave a Master Class lecture to the European Federation of Trauma and Orthopaedic Surgery in Paris on hip replacement following hip fracture. He has also lectured on short stems in total hip replacement in Paris in 2014 at the Institut Kerboull. Having introduced many new technologies and hip surgery to Mid Essex including small incision surgery, hip resurfacing and cementless total hip replacement, he also has had the pleasure of lecturing local patient groups, Osteopaths, Chiropractors and Physiotherapists. 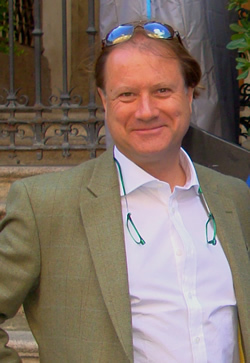 Being able to lecture in both English and French, Mr Charnley was honoured to be awarded in 2005, the best prize for a scientific presentation in Toulouse at an International Hip Meeting. In addition to joint replacement surgery, Mr Charnley also performs arthroscopy of the knee but no longer ligament reconstruction. Mr Charnley believes that communication between himself and his patient is essential, particularly in view of the increasing burden of medical litigation. He works with Anaesthetists who routinely perform modern day anaesthesia for joint replacement surgery and one of his colleagues, Dr Kevin Kiff, has also specialised in Intensive Care Treatment. On the basis of Mr Charnley's extensive experience, he is now instructed on a regular basis by Lawyers to act as an Expert Witness in potential cases of medical negligence and equally by NHS Trust in defence of such claims. Mr Charnley has a prepared fee sheet structure outlining his charges for surgery and consultations and he also has a practice which follows the recent GDPR Guidelines.